Robert: The estate's safe in Mary's hands with Henry and Tom to help her. Edith has risen from the cinders in the hearth to be kissed by her very own Prince Charming. What more can we ask? Cora: A long and happy life together, just we two, to watch the children grow. That's all I want. Robert: And why not? We never know what's coming, of course, who does? But I'd say we have a good chance. Henry: Will you be best friends now? Mary: Oh, you're such a sentimentalist. Mary: Never you mind. We're sisters, and sisters have secrets. Permalink: Never you mind. We're sisters, and sisters have secrets. Amelia: This is ridiculous. Father, Mrs. Crawley wants to take you away from your son and your family and kidnap you into marriage. What do you say? Lord Merton: How perfectly marvelous. Violet: And who can argue with that? Permalink: And who can argue with that? Isobel: What was all that about? Violet: In Denker's mind, she is Salome. You know, dancing rings around Spratt's Herod. Permalink: In Denker's mind, she is Salome. You know, dancing rings around Spratt's Herod. It's good to be in love, whatever age. Permalink: It's good to be in love, whatever age. Barrow: Forget about Coyle and your time in prison. You think the strong decision would be to see him but you're wrong. The strong decision is to take away his power over you. Leave him behind, Miss Baxter. Get on with your life. Let that be my parting gift to you. Baxter: I wonder if you're right. Lord Merton: I'm not too downcast. I've had a good innings. Seen and done a lot in my time. I should've liked to have been married to you. But no man can have everything. And at least we're friends again. Isobel: Oh, yes. We're friends again. Permalink: Oh, yes. We're friends again. Edith: And you wrote so well about dressing for town and country in autumn. Could we have a little more of that? Spratt: Oh, I'm full of ideas when it comes to combining comfort and elegance, m'lady. Permalink: Oh, I'm full of ideas when it comes to combining comfort and elegance, m'lady. Violet: Makes me smile, the way every year we drink to the future, whatever it may bring. Isobel: Well, what else could we drink to? We're going forward to the future, not back into the past. Violet: If only we had the choice! Permalink: If only we had the choice! It is your kingdom now, your village, it is your hospital. And... I think you run it very well. Permalink: It is your kingdom now, your village, it is your hospital. And... I think you run it very well. We are very grateful to you, Carson. I hope you know that. Very grateful indeed. For everything. What a wonderful life we're going to have. Permalink: What a wonderful life we're going to have. Well, there's a lot at risk, but with any luck they'll be happy enough. Which is the English version of a happy ending. Denker: Oh, Mr. Spratt. I know you resent me. 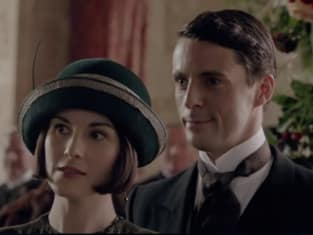 Spratt: Why would I resent you? Denker: Because I'm interesting, because I'm exotic, because I'm attractive. Spratt: Oh, dear me, this is worse than I thought. Do you always have trouble distinguishing fact from fiction?